While our nation’s inland and coastal waterways play host to hundreds of recreational boats, at the same time they also carry barges, tugboats, towboats, and large ships loaded with tons of cargo. Being aware of the constraints under which these commercial vessels operate can arm recreational boaters with the best boating safety and protection against danger and could save your life! This web page is intended only as a supplement to other sources of information on boating laws, boating safety, seamanship and basic rules of the road. 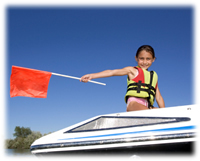 It assumes that you, the boat operator, know the rules and appropriate signals for boating safety. If you don’t, contact the United States Coast Guard concerning boating safety training. The speed of a ship, towboat, or tugboat can be deceptive. A tow can travel one mile in seven minutes- a ship even faster- and it generally takes 3/4 to 1 1/2 miles to stop. For example, if a water skier falls a thousand feet in front of a moving tug or tow, the skier has less than one minute to get out of the way. Large vessels must maintain speed to steer, and they must stay in the channel-it’s the only place deep enough for them to operate. Many channels are unmarked. On some waterways, the channel extends bank to bank, so expect vessel traffic on any portion of the waterway. A pilot’s “blind spot” can extend for hundreds of feet in front of deep-draft ships, tugboats and towboats pushing barges. In narrow canals a tug’s or tow’s powerful engines can cause a smaller vessel to be pulled toward the tow when passing alongside. “Wheel Wash” is a strong underwater current caused by towboat or ship engines that can result in severe turbulence hundreds of yards behind a large vessel. Sailboating on inland rivers can be hazardous, and sailboaters and wind surfers should know that a tow or tug can “steal your wind”-so you won’t have the same wind you started with when executing a sailing maneuver near a commercial vessel. Towboats and barges approaching bridges and locks must be lined up and committed to their approach well ahead, and it’s dangerous and difficult for them to change course. For safety, stay out of their path. Understand whistle signals. At least five or more short blasts on the whistle is the “danger” signal. Stay clear of vessels sounding the “danger” signal. Don’t water ski or jet ski in and around tows. That’s a risk not worth taking. Jumping wakes, riding close alongside, or cutting under the bow or stern of a tug or tow could cause a boat or skier to be sucked through a towboat’s large propellers. Avoid cargo loading docks and “parked” or moored vessels in fleeting areas. There are many loading areas, or “terminals,” along the nation’s inland and coastal waterways. Stay clear! Don’t operate a boat while drinking alcohol or using drugs. It is estimated that more than half of all recreational boating fatalities are related to alcohol. It’s proven that the marine environment compounds the effects of alcohol. Watch for ship, tug or towboat lighting at night-don’t rely on trying to hear a vessel approaching. Pay attention to the sidelights of tugs and tows, rather than the masthead lights (masthead lights are not displayed by pusher towboats on the Western rivers, making it even more critical to keep a sharp lookout). If you see both sidelights (red and green), you’re dead ahead, and in the path of danger. Locks are designed to raise and lower boats from one water level to another, allowing vessels to travel upstream and downstream. The locks are open 24 hours a day. However based on prevailing tide conditions, the locks may be closed in either direction for intervals of 10-15 minutes at a time. The lock operator controls all movement of boats through the lock by light signals or horn devices. All canal locks and lift bridges monitor marine radio channel 13 and cellular phones. The following are tips and suggestions for a safe and pleasurable trip through the locks; locking through is easy! Approaching the Lock. When approaching the lock, boaters should stop at a safe distance and follow specified signals. Boaters must give three (3) distinct blasts on the horn, whistle, or other signaling devices. Green: Lock is ready, craft may advance. No Light: Craft must wait or tie up to approach wall. Six flashes of red or green: remain stopped and await further instructions. Keep the channel near the lock gates clear and allow boats departing or entering the lock a safe and easy passage. Be patient if lock staff are not ready to lock you through immediately since they often have other water management duties. Entering the lock. On entering the lock chamber, vessels must proceed under control at a safe reduced speed. All boats bust be equipped with adequate mooring lines and fenders. Lock operators are not required to handle or furnish lines. As you near the walls of the lock chamber, have your crew members ready to loop their lines around the snubbing posts, lock wall ladders, and tie lines; be sure to loop, do not tie your lines or your boat may be left hanging or damaged as the water level changes. Be alert to other boats entering behind you and move forward if necessary. Serious injury can result from using your hands or feet to fend off a wall. Use a boat hook, oar, or paddle. Line handlers should wear PFD’s. Passengers who are not involved should remain seated. In the Lock Chamber. Follow directions of the lock operator and when safely positioned against the chamber walls with lines looped, turn off your engine (but leave the bilge blower on) and do not smoke or operate open flame appliances. Never leave your boat unattended in the lock. Exiting the Lock. As soon as the water in the lock chamber reaches the proper level, the gates will be opened, boaters should case off all lines and proceed at a reduced speed to exit the chamber in station order. Remember to observe posted speed limits and stay clear of dams in lock areas. Boating Safety Courses in New York, New Jersey and Connecticut. Earn your State Certification (aka License) at one of hundreds of locations in the New York metro area. Learn about State & Coast Guard boating laws, Boating Safety, Navigation, Seamanship and Personal watercraft Operation among other topics covered in class. The U.S. Coast Guard has safeguarded our Nation’s maritime interests for over two centuries. Visit the USCG website to obtain additional boating safety information. The US Coast Guard Auxiliary performs services such as vessel safety checks, harbor patrols, search and rescue, marine environment protection and boating safety courses. Learn more by visiting this site. As America’s largest non-profit boating organization, the USPS is dedicated to boating safety to make recreational boating a more enjoyable experience through classes in seamanship, navigation and related subjects. The Boater’s Resource Center is designed to be a single source of boating safety information for the recreational boater. With “one stop” a boater can get weather & tides data, the latest local notices to mariners and other important information. 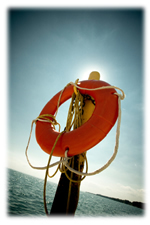 Provided by boatingsafety.com, this is a simplified checklist of boating safety items for recreational boating. Get your certification in Navigational Rules through classes offered from Safe Boating America and in conjunction with the Association of Maritime Industries. The Incident News site has news, photos, and other information about selected oil spills (and other incidents) where NOAA’s Office of Response and Restoration (OR&R) provided scientific support for the incident response. The Coast Guard Navigation Center provides cutting edge services for safe, secure, and efficient maritime transportation. The First Coast Guard District – located in the heart of Boston, Massachusetts – provides service in Maritime Safety, Homeland Security, National Defense, and Environmental Protection. Find tide tables applicable to various areas along Long Island. View this site to obtain applicable nautical charts prior to making way on the waters.